If you use a forever forward incremental or reverse incremental backup method, the backup job constantly transforms the full backup file in the backup chain to meet retention policy settings. The transformation process, however, has a side effect. In the long run, the full backup file grows large and gets badly fragmented. The file data occurs to be written to non-contiguous clusters on disk, and operations of reading and writing data from and to the backup file slow down. To resolve the fragmentation problem, you can instruct Veeam Backup & Replication to compact the full backup file periodically. During the file compact operation, Veeam Backup & Replication creates a new empty file and copies to it data blocks from the full backup file. As a result, the full backup file gets defragmented and the speed of reading and writing from and to the file increases. To compact the full backup file periodically, you must enable the Defragment and compact full backup file option in the backup job settings and define the compact operation schedule. By default, the compact operation is performed on the last Saturday of every month. You can change the compact operation schedule and instruct Veeam Backup & Replication to perform it weekly or monthly on specific days. The Defragment and compact full backup file option can be enabled only for backup jobs for which active full and synthetic full backups are not scheduled. The compact full backup file operation is not performed during backup job sessions that produce active full backups. If the backup job starts again on the same day when the active full backup was created, Veeam Backup & Replication does not perform the compact full backup operation. This limitation helps reduce the number of backup operations — Veeam Backup & Replication considers that the full backup is recent and does not need to be rebuilt. If such situation occurs, Veeam Backup & Replication triggers the full backup file compact operation during the next backup job session that produces an incremental backup file on another day. The compact full backup file operation is not performed for offloaded full backup files. For more information, see Capacity Tier. The backup repository must have enough space to store a file of the full backup size. During the compact process, Veeam Backup & Replication creates auxiliary files that exist on the backup repository until the end of the compact operation. 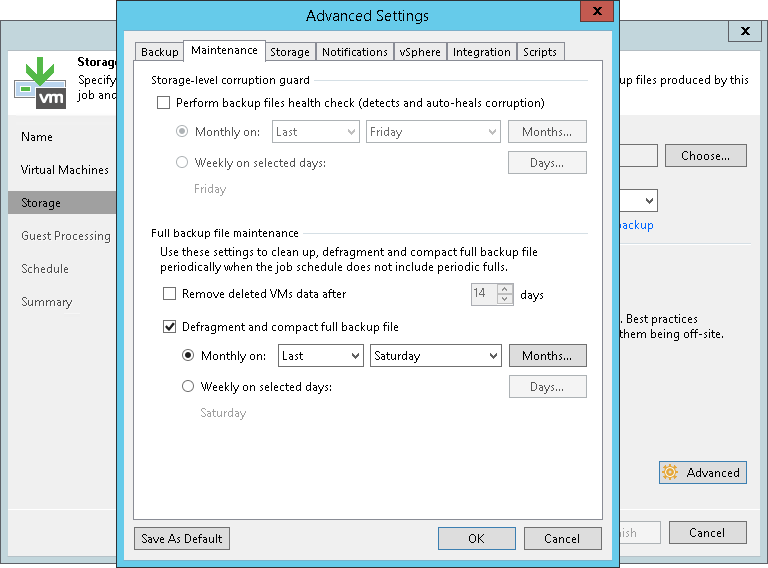 [For per-VM backup chains] If you add a new VM to an existing backup job that has been run for some time, Veeam Backup & Replication will perform the compact full operation for it during the next incremental backup job session for the added VM. If you change the block size in backup job settings, Veeam Backup & Replication does not change the block size in the compacted backup file till the next full backup. However, if you change compression settings in backup job settings, during the next compact file operation Veeam Backup & Replication changes the compression level for the compacted backup file. During the compact operation, Veeam Backup & Replication does not copy all data blocks from the VBK file to the newly created file. It copies only data blocks of VMs whose information is stored in the configuration database. For example, if the VM is removed from the backup job, its data is not copied to the new full backup file. This approach helps reduce the size of the full backup file and remove unnecessary data from it. If the full backup file contains data for a VM that has only one restore point and this restore point is older than 7 days, during the compact operation Veeam Backup & Replication will extract data for this VM from the full backup file and write this data to a separate full backup file. Such backup will be displayed under the Backups > Disk (imported) node in the Home view. The Remove deleted VMs data option is not enabled in the backup job settings. The Use per-VM backup files option is not enabled in backup repository settings.